Barley Grass ( Hordeum vulgare ) is one of the green grasses. It has served as a staple food in most cultures. Scientists believe it has been cultivated since 7000 BC and we know that Roman gladiators ate barley for strength and stamina. Green barley leaves contain astounding amounts of vitamins and minerals. NOW’s barley grass is 100% organic from dehydrated, unjointed leaves. It is a granular-like loose powder. 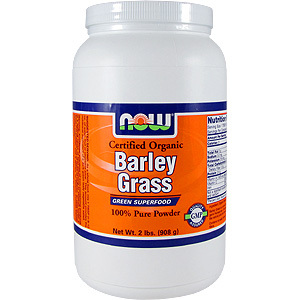 No chemicals or additives are used in the processing of barley grass and all bulk powder ingredients are GE free. The jointing stage is the period during which a cereal grass plant is transformed from a vegetable to a grain. NOW’s barley grass is grown in Kansas soil and harvested just prior to jointing, when the cereal grass is at its highest nutrient period. After the jointing, the nutritional level in the leaves drops rapidly. Direct cutting of the barley grass is performed so the leaves never touch the ground. The leaves are then dehydrated in low temperature dehydrators to preserve their nutritional integrity. Milling is done using a cryogenic method, which pulverizes the barley grass at room temperature or below. What is Blue-Green Algae and how is it processed? Blue-Green Algae is a nutrient-rich green food that grows naturally in remote areas of mineral-rich Klamath Lake in the upper Oregon Cascades. As with most green foods, it is an excellent source of vitamins, minerals, trace elements, enzymes, amino acids, and protein (60% average). It is processed using low heat dehydration and is carefully screened to ensure the absence of unwanted microbes or toxins before it is freeze-dried. What is the equivalency of NOW Broccoli Concentrate to fresh broccoli, and how much sulfophane per serving does it contain? A stalk of broccoli can provide up to 220% of the daily value of vitamin C and 15% of the daily value of vitamin A as beta carotene. In addition, broccoli contains other phytonutrients that provide additional antioxidant activity. Two of our Broccoli Concentrate tablets provide the same amount of phytonutrients as a half cup of fresh broccoli and contain 1700 mcg of sulforaphane, 34 mg total glucosinolates, and significant amounts of sulfur. This product is derived from whole, fresh broccoli with certified levels of phytonutrients. What Green Superfoods does NOW currently carry? Because they are so important to overall health, NOW carries a number of different Green Superfoods. We currently carry Alfalfa, Barley Grass, Blue-Green Algae, Broccoli Concentrate, Chlorella, Chlorophyll, Dulse, Kelp, Spirulina and Wheat Grass. 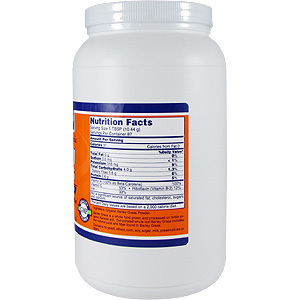 We also carry supplements like Eco-Green Protein Powder Meal Replacement and Green Phytofoods powder and tablets. How do you use your Kelp powder? Do you mix it with water? Tomato or any vegetable juice works best and the resulting mixture tastes much better than kelp in plain water. Use at least 8 oz. of liquid per serving. Sprinkling kelp on foods such as salads or soups can work well, taking advantage of its unique taste. 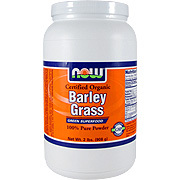 Barley Grass Organic shipped in a discrete, unmarked package. Orders are processed immediately and usually take about 3 to 5 working days to be received. We do ask that you try it for 2 to 3 weeks to feel the full effects. Any information received is used only for order processing and shipping purposes. Your information, such as e-mail address, will never be disclosed to a third party.